Quick Smart Air Tool Oil offers the correct lubrication for most types of air tools. The oil offers corrosion protection and resists wash action due to action of wet air. 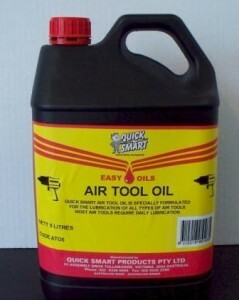 This long lasting, super slick product allows air tools to run easier and last much longer. It is a complex blend of pure petroleum oils and additives especially formulated to combat rust and varnish for the working professional.